1 CD with 36-page booklet, 31 individual tracks, playing time 78:32 minutes. The story of Tom Tall and Ginny Wright is inextricably bound up with one of the music business’s larger-than-life characters: Fabor Robison. In addition to Tom Tall and Ginny Wright, he also discovered Johnny Horton, Jim Reeves, the DeCastro Sisters, Mitchell Torok, the Browns, Bonnie Guitar, and Ned Miller. That would be enough talent for any label, but Fabor managed to alienate them all (in fact, it’s rumoured that Jim Reeves wanted to shoot him). Ginny Wright came to Fabor Records to cut a duet with Jim Reeves , and I Love You was a big country hit, peaking at #3 in 1953/4. 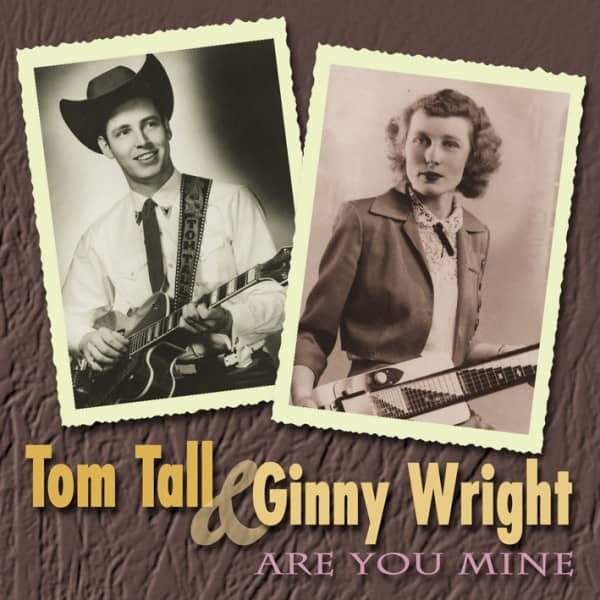 In November 1954, Ginny Wright recorded Are You Mine with Tom Tall, and it became a #2 country hit, and makes its first-ever appearance on CD here. But then, with the record high in the charts, Ginny Wright just simply quit. She went back to Texas. Years later, she recorded again and even made some more records with Tom Tall, but mostly she cared for her family in Texas. In 2003, she reappeared briefly to become a Louisiana Hayride Hall of Fame inductee. Tom Tall (no, not Tom T. Hall, but Tom Tall) was also from Texas, although his family migrated to California when he was a kid, and that’s where he met Fabor Robison. For a couple of years in the early/mid 1950s, Tom Tall looked like a contender. He made sharp west coast country music with a hint of rockabilly (like the classic Hot Rod Is Her Name), and appeared on all the top shows…'Ozark Jubilee,' 'Town Hall Party,' and 'The Grand Ole Opry,' and even toured Texas with Elvis. He was a talent who just didn’t get the breaks. Later, after leaving Fabor, he befriended Eddie Cochran and hung around the Los Angeles music scene before moving to Las Vegas, where he is to this day. Now Bear Family tells the unique and fascinating story of Tom Tall and Ginny Wright with Fabor Robison pulling the strings in the background. Longtime fans will remember our Ginny Wright and Tom Tall LPs, and now they're on CD with additional tracks and completely upgraded sound. "Tom Tall & Ginny Wright"
Customer evaluation for "Are You Mine"
With Bear Family, you expect high quality in the recordings AND the documentation. But there is NO session information at all. I'm disappointed. Go to Praguefrank's web site if you want the details.